Chácara Fortaleza has been leased for more than 15 years with great acceptance of all our customers. We make daytime events of all kinds: we offer 25,000 m² of green area for weddings, corporate gatherings, birthdays, children's parties, 15 year old party, baptisms, workshops, all kinds of events! The Fortaleza farmhouse, surrounded by Atlantic forest and located at the edge of the Billings Dam, has a private beach and exclusive use where you can practice fishing. We have tables, chairs, changing rooms, court, ecological trail, orchard, etc. We have Buffet services, decoration, sound, recreation and toys. 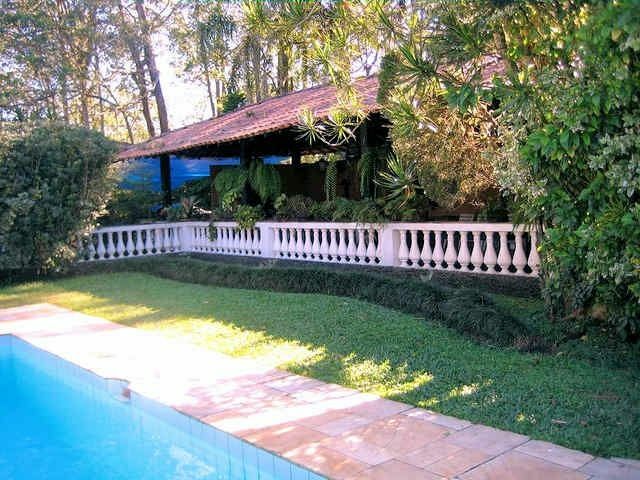 We are 20 minutes from Ipiranga, 10 minutes from São Bernardo do Campo and 5 minutes from Via Anchieta. See our map and schedule a visit. Chácara takes responsibility when it comes to cleaning. Everything is always well organized and clean-both before and after the events. agradecemos seus elogios, ficamos satisfeitos com o seu contentamento no seu evento. 25,000 m² of green space, Landscaped landscaping, Located on the banks of the Billings Dam, Events with fishing, Ecological path in enclosed forest, Poly-sports court, Adult / children's L-shaped pool, Indoor grill, Spectacular view of the Dam Billings, Changing Rooms (Female / Male), Forest.